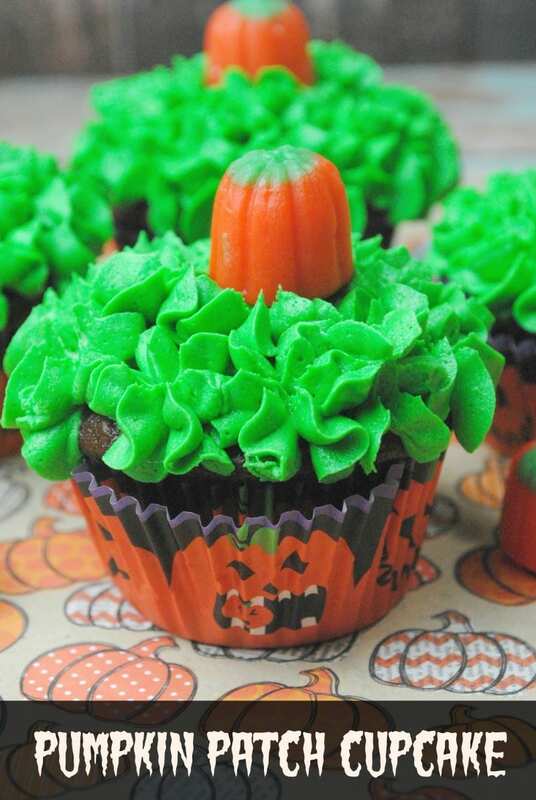 Your kids will just love this Pumpkin Patch Cupcake recipe for Halloween! They are easy to decorate and taste so yummy! Combine the eggs, milk, oil and vanilla in a bowl. Add this to the dry ingredients beating on medium until the batter is smooth. Cream the butter, vanilla, and powder sugar until it looks light and creamy. If it doesn’t cream, add several drops of the heavy whipping cream until it creams. Add several drops of the green gel food colouring. Mix well to blend the colours. Test to see if the frosting can form and hold a stiff peak by taking a spoonful of frosting and turning the spoon upside down. If the frosting stays on the spoon it is ready if not then add more powder sugar 1/2 Cup at a time and mix well. Instead of holding the pastry bag and tip to the side hold it straight up pointing the tip down to the cupcake making the frosting look like grass. You can add an candy pumpkin in the center of the grass patch (center of the frosting). I hope you enjoyed my Pumpkin Patch Cupcake recipe. If you make it, make sure to share with us on Facebook or Twitter! Also, check out all of our other Recipes. Combine the eggs,milk, oil and vanilla in a bowl. Add this to the dry ingredients beating on medium until the batter is smooth. Very creative! And I love those candy pumpkins so these would be great. These are such a cute cupcake and perfect for the up coming Halloween night parties!! Very cute pumpkin cupcakes, would make a great treat for special times. How cute are those? It sometimes really is the simple things. These cupcakes look perfect for Halloween and a party we are having for the kids soon.They will love the.Thank you for this post. My pleasure Wanda! Let us know how they liked them! Adorable! Perfect for the cupcakes I have to make next week for my office pot luck. Let us know how they like them! Wonderful! Let us know how she liked them! I love these cupcakes, they’re so cute ! Those are the cutest cupcakes ever,love those for the Season!